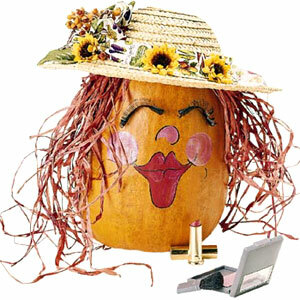 clear, and you will be inspired to create many wonderful items for your autumn or Halloween decor. 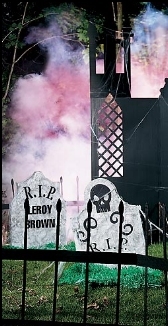 trick-or-treating can be traced back to the early 1900s, but the decorations of all things scary began much before that. 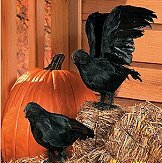 Some time around the late 1800s pumpkins, witches, black cats, and ghouls began appearing in parades, adorning city streets, and decorating homes. Great resource for anyone who buys, sells, collects vintage Halloween! parties for adults as well as children. Halloween decorations became widely available during the 1910's and Halloween Merrymaking presents hundreds of photographs depicting these vintage decorations. Throughout the book writers of the times dispense advice, squarely aimed at women, on how to throw a successful Halloween party. The book even provides sample menus for different types of parties such as formal, informal, or children's. Next up is the entertainment with suggestions on music and dances and games, as well as advice on costumes. We begin with invitations with some classic examples of period artwork depicting pumpkins, witches or black cats. Showing far more thought, as well as sophistication, magazines even gave advice on what to write, often favoring catchy little rhymes. This is a nostalgic walk back in time to an era of simplicity and fun. It's fun and educational to see how our grandparents and great-grandparents may have celebrated Halloween decades ago. So many halloween books are geared towards kids -- it's refreshing to find one aimed at adults. And adults with style, not just adults who like blood & gore. This book has crafts & decorations for a very elegant adult Halloween celebration. The photos are lavish, the instructions are clear, & the projects require only basic tools & sewing skills. As a regular on TV's Bewitched, Kasey Rogers (Louise Tate) has the right pedigree to produce Halloween Crafts: Eerily Elegant Decor. She and coauthor Mark Wood have dreamed up some pretty innovative approaches to such timeworn Halloween delights as pumpkin carving, table decorating, and party giving. 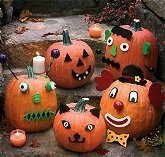 Rather than limit carving to traditional orange pumpkins, they offer devilish red imps made of bumpy gourds and green glow-stick eyes, or a jaunty goblin king carved of green hubbard squash. A decrepit old butler figure presides over the "graveyard tea," and the "harvest of skulls" centerpiece features a tower of grinning plastic skulls topped with drippy black (electric) candles. Smple recipes makes up the "Boo-fey," along with two versions of punch contributed by another Bewitched alumnus, Bernard Fox (Dr. Bombay). If you're into creating your own Halloween decor, this book is for you! celebrate Halloween with creepy decorations, clever costumes, eerie treats to eat, and more! 100+ projects with instructions and patterns. 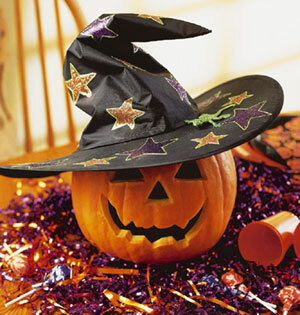 Plop a prop witch hat on a pumpkin for a quick table decoration. No-carve pumpkin using items around the house. 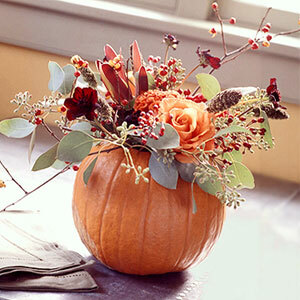 Pumpkin and Roses Centerpiece - easy floral arrangement for fall. "pop!" to reveal a gush of goodies. Use easy sewing, stamping, and painting techniques to make 20 projects. 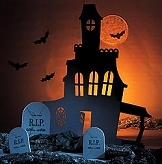 make planning a Halloween party easy, with 101 Spooktacular Party Ideas filled with ideas that will help you haunt your house with boo-tiful decorations, sinisterly delectable treats, play bone chilling games and make fiendishly fun crafts and party favors. More focused for children, but has ideas suitable for adults. 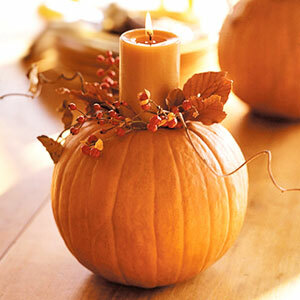 Great ideas for indoor and outdoor decorations, also has wonderfully creative recipes. 101 Spooktacular Party Ideas features 9 outdoor decorations, 10 indoor decorations, 10 quick and easy treats, 15 make ahead treats, 10 beverage ideas, 22 relay and active games, quiet games, craft and party favors, and more! Creative Costumes, Devilish Decor & Fabulous Festivities. Wonder Woman or Peter Pan. And for the children, check out Nursery Rhymes, Fairy Tales, and Other Costumes. beings and cultural tributes, most of the costumes can be assembled without a sewing machine and in only one evening. Many of the costumes are made form Polarfleece (a perfect Halloween fabric which is soft and lightweight, slightly stretchy, warm, versatile, with no hemming or seam finished needed -- and hotglues like a dream!). Although specifically targeted for the Halloween holiday, these are delightful outfits that can well serve for costume parties and school plays at any time of year! The color pictures of the kids in the costumes are wonderful!! Great idea! Trick or treat - trip down memory lane, this book celebrates All Hallows' Eve in American graphic and print media from the early 1900s to the '60s. Featuring witches, ghouls, ghosts, and jack-o-lanterns, the scariest postcards and decorations, the silliest costumes and candid photos are collected here. With an introduction tracing the unexpected history of Halloween and its traditions, Vintage Halloween is a nostalgic tribute to one of America's favorite holidays. Vintage Holiday Graphics offers one of the best collections of Olde Halloween images yet available. Drawing material from postcards, paper decorations, magazines, advertisements, package labels, private period photographs, sheet music, masks, costumes, party favors, and other varied sources, the book offers almost two hundred pages of visionary iconography, that, for many, will definitely represent the very nature of the holiday itself. Traditional images of ghosts, scarecrows, bats, fairies,pumpkins, and human tricksters in colors of orange, black, white, and green predominate, though some of the images were clearly culled from the Fifties and Sixties, and thus the occasional helmeted spaceman or antenned robot appears. 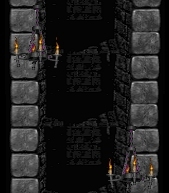 Halloween Decorations from Shindigz Party Props. Useful reference for adults who revel in Halloween and folks who seek to make the trick-or-treat experience a little more harrowing for unsuspecting children in costume. Trick-or-treat night! Haunted house week! Dress up and pretend night for grown-ups! Chapters on decorating the house and yard, pumpkins, DIY costumes, parties, music, movies, recipes, actual expeditions to haunted locations, myths and monsters, Invitations, theme party ideas, games that are actually fun, fortunes and favors, sound effects, lighting ... it's all here. The decoration ideas are not the same old tired ones we are used to seeing and are easy to create. There's even a long list of clever epitaphs for your frontyard gravestones. The pumpkin chapter loaded with wonderful ideas, plus legends and how-tos. Innovative, funny, spooky and easy costumes are found in abundance in this book - did you know bird-seed makes the best false bosom? Need a recipe for some good fake blood? Choose from quick and easy blood, soaking and spreading blood, or cheap two ingredient blood with a bit of concentrated coffee for realism. Do you want dead skin, rotting skin, or old wrinkled skin? No problem - unique decoration ideas here that will help make your party shine. Excellent recipes for party foods for Halloween that are fun. Listing of classic Halloween horror videos broken down into categories, a list of spooky classical music for Halloween atmosphere, a list of the best Halloween scary stories. There's even a list of places reputed to actually be haunted ... if you have the courage! Halloween craft book for kids - DIVIDED INTO 3 CATEGORIES : LIGHTS AND DECORATIONS, DRESSING UP, AND PARTY TIME. There are descriptions and photos of additions to fairy, pirate, witch, vampire, and ghost costumes, with elaborate face painting and perfectly cut-out, acrylic-painted, paper-plate masks. Refreshments include sausage fingers, "bread roll monsters," gorgeous-looking creepy cupcakes, and "cauldron cocktails." Finally, there are instructions for a shadow theatre and other traditional party games. The photographs are stunning, but all of the projects look like they were made by adults or particularly handy, older children.